Our boys will not stop growing. We are not too upset about it though. I know a lot of moms who are sad when they have to pack away clothes that are outgrown or when milestones have been reached. I on the other hand get really excited. To me it means that our boys are healthy and growing just like they should. September is turning out to be a big month for milestones! 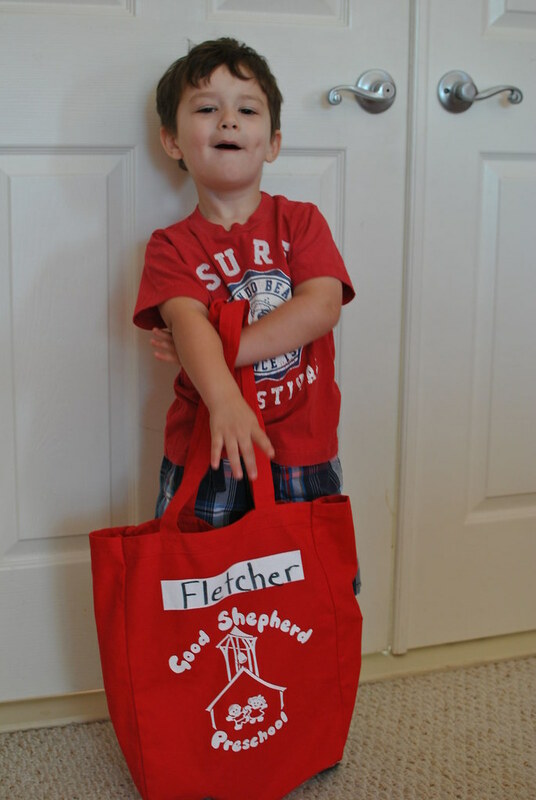 Fletch started Pre-K on September 10th. 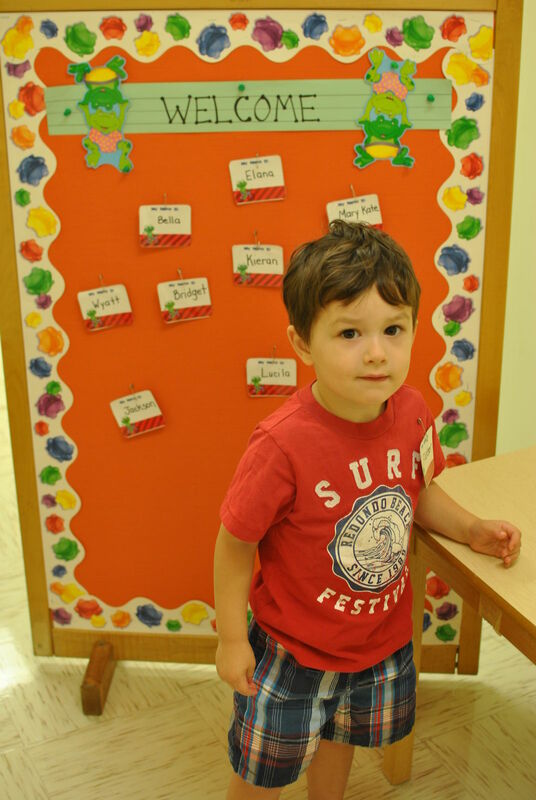 We enrolled him at Good Shepherd Preschool and he is going three days a week (MWF) for three hours. On day one, he was apprehensive. Fletch did not really want to go into class without me. Since I was with him on his meet-the-teacher day, I think he thought I would be coming along with him to class. He did not want to go into class, so his teacher Mrs. Barron let him know that he would be making play-dough that day. After the mention of the magical stuff that mama never lets him play with, he was sold. 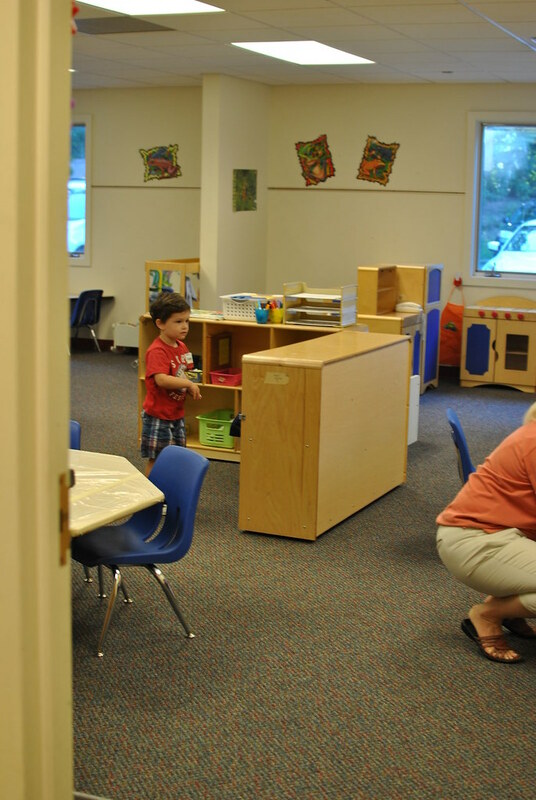 Away he went into the classroom for his first day of school. Mrs. Barron let us all know that the second day is usually the hardest since the kids figure out that they are in for the long haul. She was right! The second day Fletch did not want me to go and he did not want to go to class. He told me he wanted to go to the potty instead. Now considering how much he fights us when we ask him to go sometimes, it says a lot that he would rather go potty than to class. I gave him lots of hugs and reassurance and Mrs. Barron told him he would be learning about faces that day. I started singing a Yo Gabba Gabba song about faces and he decided that he would like to stay and learn about them. Whew! By day three, Fletch let me know in the car on the way to school that I need to take him to school and then I should go home. I asked him if it was okay to pick him up later. He agreed and said that I could pick him up and take him home so he can play with his toys. Since then he has been very excited to go to school each day. I made the mistake of showing him the snack I got for our assigned day, because once I showed him he couldn't wait to break into the bag and eat it. Luckily I was able to keep the class snack from being eaten beforehand. He is in Mrs. Barron's Frog class. Each kiddo is assigned an animal. They have that animal sticker on the back of their chair, coat hook and lily pad so they know where to go. Fletch has been assigned as the monkey of the class! I could not think of a more appropriate animal for him. We love asking him about his day at school and about his new friends. Wyatt had a couple of milestones of his own this month. 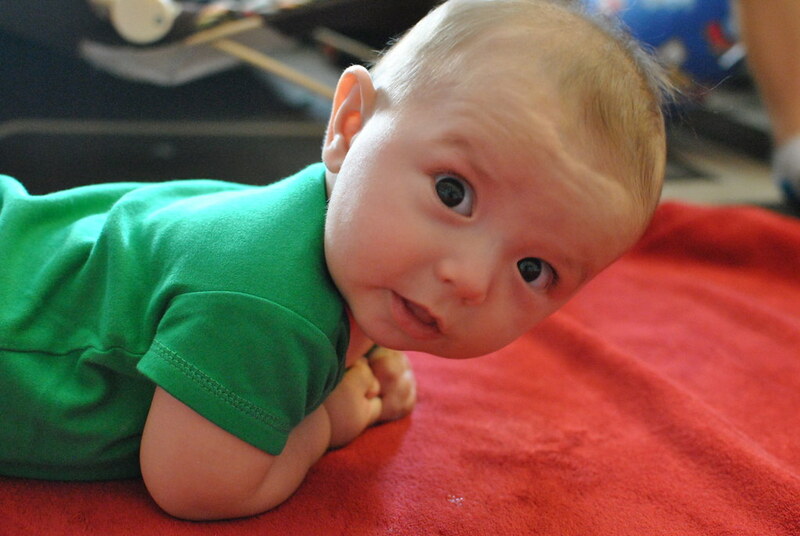 Not only did he turn four months old this month, he decided to start rolling over from his back to his tummy. Now I cannot get this kid to stay on his back! He is one rolly-polly baby. His hands are constantly in his drooly little mouth too. 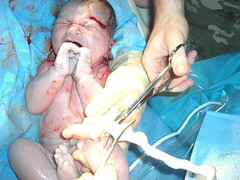 At his four month appointment the doc looked in his mouth. He's not teething yet, but might be pre-teething. I remember Fletch was pretty drooly at this age as well. 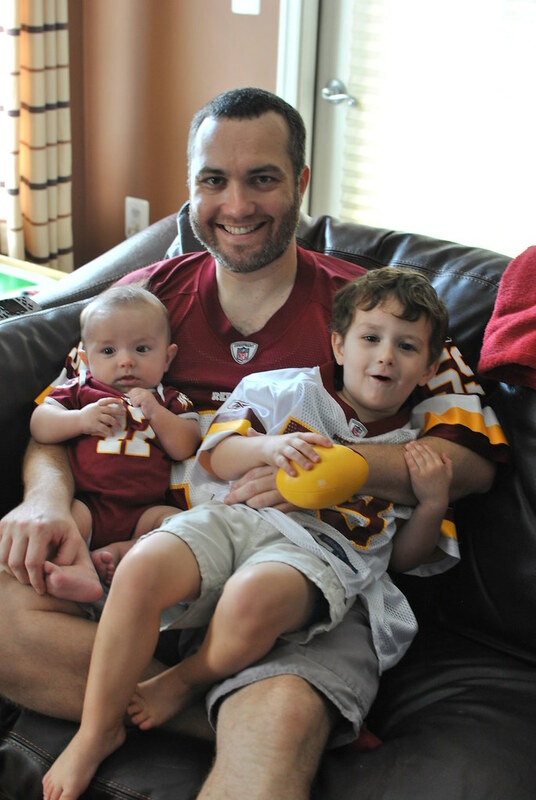 Wyatt also got to watch his first Redskins game with Daddy and Fletch. He is well on his way to becoming a football fanatic. Wyatt is now sixteen and a half pounds! He's in the 87th percentile for weight. He is wearing six-month pj's too. We are so thankful to have two happy, healthy growing boys! Your boys are so cute! I cannot believe how big they are getting!